In the past, losing teeth meant your appearance and your ability to eat normal foods would be greatly impacted. Today with dental implants, you can maintain a natural appearance and the ability to eat the foods you enjoy with teeth that feel like your own. Dental implants are a safe, medically proven alternative to traditional bridgework and removable prosthetics. Made of titanium, implants are screw like anchors placed in the jaw bone to take the place of your missing tooth root. After the bone has healed around it, a process called “integration,” you are ready for restoration. This could be a single tooth replacement with a crown or multiple teeth replacement with a bridge. Sometimes the implant can be used as a connection to securely add precision attachments to a partial or denture. The increase in stability and retention is then many times greater than the conventional appliance. The implant process involves several steps that take place over a 4-9 month time period. First is a consultation with your dentist to evaluate if you are a good candidate for dental implants. Next is the placement of the implant into the bone by a dental surgeon while you are under either local or general anesthesia. Over the next few months, the bone will heal to the surface of the implant. After this healing period is over, an impression is taken and the type of restoration you need will be fabricated. Maintain Anatomy: If you have missing teeth, the bone begins to shrink over time. This bone loss can make you jaw line recede and change your facial structure. Dental implants can help prevent this from happening by holding the bone. Keep Your Teeth Healthy: Your own natural teeth are not compromised because there is no need to grind down healthy teeth to attach a bridge. Also, no metal clasps are needed to hold your removable partial. Security: Dental implants do not slip or move while you are talking or eating. This eliminates some of the problems of dentures and partials, including poor fit, gum irritation and trauma to the teeth with clasps. Chronic illnesses such as diabetes or leukemia may interfere with the healing after surgery. Another contraindication is for patients who are taking a category of drugs called “bisphosphonates,” especially the IV form which is taken for metastatic cancer. However, the milder oral form of the drug, which is taken for osteoporosis, is also raising some concerns. If you have lost too much bone it could be a problem; a consultation with an oral surgeon will help you to know if you are a good candidate. The use of tobacco is believed to cause a higher failure rate. Home care is very important to the success of your implant but it is basically the same as caring for a natural tooth. 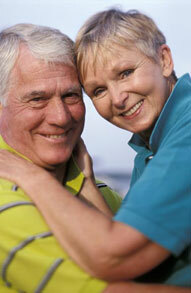 Dental implants can improve your appearance, self-confidence and give you greater peace of mind. They look and feel similar to natural teeth and give you confidence while eating and speaking. Today, your best option for tooth replacement is a dental implant.